The perfect solution for the Marine Corps enthusiast that is hard to shop for! You choose the value and we'll send the certificate and redemption code to your gift recipient via US Mail or E-mail. Complete the form to your right to purchase a gift certificate. You choose the certificate value. If you want the certificate mailed to you, enter YOUR US Mailing address. In the personalized note, you may add additional comments to our staff if needed. Additional comments will be removed prior to presenting the certificate. Discount coupons may not be used for the purchase of gift certificates. Gift certificates do not have an expiration date. Gift certificates are good for purchases from The EGA Store only and are non-transferable. Your purchase supports our troops and their families at home. 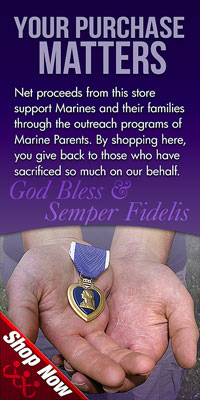 All sales in the EGA Store benefit MarineParents.com, Inc. and the outreach programs of the organization. Marine Parents is an IRS approved 501(c)(3) public charity.